Our lab is equipped with state of the art machines for performing surface nano- and microstructuring with techniques like dip-pen nanolithography (DPN), polymer pen lithography (PPL), and related techniques. 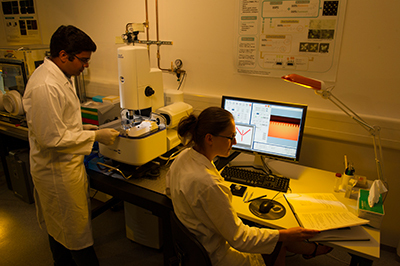 For sample characterization we have a upright and inverted fluorescence microscopes and a SEEC setup for the optical analysis of nanometer-scale thin films. Our DPN machines and expertise are available to external users worldwide by KNMF. Access for european users is additionally supported by the EUMINAfab project (http://www.euminafab.eu).